Can we talk about how much I enjoy Thug Kitchen for a minute? If you haven’t checked them out yet, be warned, it’s NSFW, but I just find their mix of creative, healthy eats and epic profanity hilarious. And they have the goods to back up that potty mouth. This chickpea tabbouleh, for example, is delightful. Light, but filling – the perfect lunch to ensure you stay full but stay awake for the rest of your afternoon. I made this with as much produce from my farmer’s market as I could find. Then I stuffed it in a pita spread with Muhammara – a very tasty walnut and red pepper based spread I picked up at Trader Joe’s. It was so simple and so delicious I was looking forward to my lunch all week. Put the chickpeas in a large bowl and mash them up until some of them are broken up and some of them are whole. I used a potato masher for this part, but a fork or pastry cutter would work too. In a separate bowl, mix together the lemon juice, olive oil, salt and pepper. Add everything else in with the chickpeas, then pour the dressing over it and toss to coat. Serve it right away or chill that in the fridge. 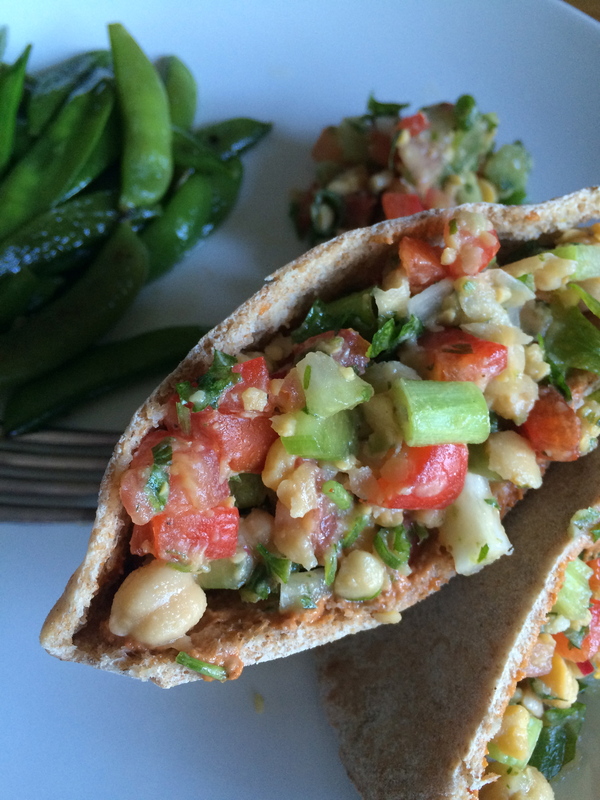 This entry was posted in Uncategorized and tagged chickpeas, fast and easy, light cooking, lunch, pita sandwich, Tabbouleh, Thug Kitchen by theculinarycapers. Bookmark the permalink.